Wiz Khalifa's felony marijuana charges have gone up in smoke. On Wednesday, Pitt County (North Carolina) District Attorney Clark Everett dropped a felony drug trafficking count against the rapper, who was arrested on November 8 following a show on the campus of East Carolina University after police found marijuana on his tour bus. 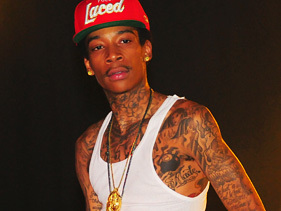 Khalifa and nine other men were subsequently charged with trafficking, maintaining a vehicle for sale or storage of marijuana and a misdemeanor offense of possession of drug paraphernalia. But according to Everett, the trafficking charge was in error, because the amount of marijuana seized on the bus — slightly more than 2 ounces, according to Greenville, North Carolina's The Daily Reflector — did not exceed the 10-pound threshold required to make the count stick. Everett told the Reflector that all additional charges against Khalifa and six others with him were dismissed when three of the men admitted the marijuana was theirs and pleaded guilty to misdemeanor possession during an August 11 hearing. Each of the three paid a $1,000 fine and court costs. In the days following his arrest, Keith Stroup, legal counsel for the marijuana-advocacy group NORML, predicted to MTV News that it was likely Khalifa's attorney would arrange for such a plea deal, in which the rapper, or one of the other men arrested, would agree to possession of marijuana for personal use. At the time of his arrest, Khalifa paid a substantial fee to a bail bondsman to cover a $300,000 bond for himself and the nine other men arrested so they could leave immediately, a tab Everett said was also an error, given the actual nature of the charges. "The magistrate or someone at that office must have misread the statute. We discovered the error maybe two hours after [Khalifa] paid the bondsman's premium and left," he told the Reflector. "Because of that, it was a high price he paid for bringing the drug onto campus. Had he remained to discover the error, he would not have been bonded so high. Probably $1,000." A spokesperson for the Pitt County District Attorney's Office did not respond to MTV News' request for comment on the matter by press time.